Bindo offers an integration with Shopify that allows you to connect your Bindo store to your online store powered by Shopify. With this integration all of your product information can be managed in one place. Create your products in Bindo and names, prices, quantities, images and more sync up with Shopify. Orders placed on Shopify will show up in your POS, deduct inventory from your store, and be recorded in your reports as "Web Sales". If an item is out of stock in Bindo it will show out of stock online. Bindo product images are the images that you want displayed online. You may add multiple images to a product in Bindo and all images will be pushed to your Shopify store. 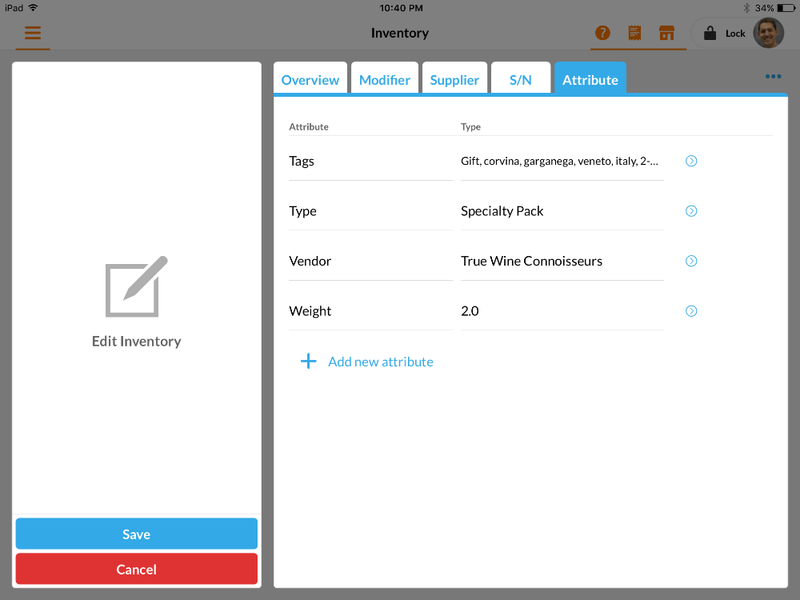 Add custom fields to Bindo inventory items to set up Shopify "Tags", "Weight" (in lbs), "Type", or "Vendor" (the Bindo Supplier field is not synced with Shopify) as shown in the below image. Outside of the standard fields included in the integration (Product Name, Description, Image(s), Price, Barcode, and Quantity) these four fields are the only Shopify specific fields that are supported in the integration. To add information using these fields It is required that your "Attribute" names match the exact field names. For example, if you create an attribute title called "Tag" instead of "Tags" it will not sync properly with Shopify. The values in these custom fields are pushed to Shopify as is, except for Tags which can be separated by commas in the Bindo field to create multiple tags (ie Tags entered in Bindo as "red, gift, stylish" will create three separate product tags in Shopify: "red", "gift", and "stylish"). Note that any fields outside of the ones listed above will not be created for your products and must be created in Shopify directly. For example "Website SEO" fields such as "Page Title" must be edited in Shopify directly. It is important that if you do edit fields in Shopify that you edit only those fields that Bindo does not create/update directly. If you attempt to edit a field such as product name, or if you add an image to Shopify directly (both name and image are fields managed by Bindo), Bindo will subsequently overwrite your change. Make those changes in Bindo and Bindo only. However there is one exception to this rule, which is that you may choose to manage your product descriptions separately between Bindo and Shopify (Bindo product descriptions will overwrite all Shopify descriptions - you may select Yes or No). Send an email to support@bindo.com to request that the integration be set up. Items created in Bindo, pushed to Shopify, and subsequently deleted or marked "In Store Only" in Bindo will not be deleted in Shopify but rather marked "unpublished". Since items that are deleted in Shopify are deleted permanently we designed the integration this way to prevent accidental deletion of items. To delete an item in Shopify log into your Shopify store and delete it directly from the Shopify admin dashboard.